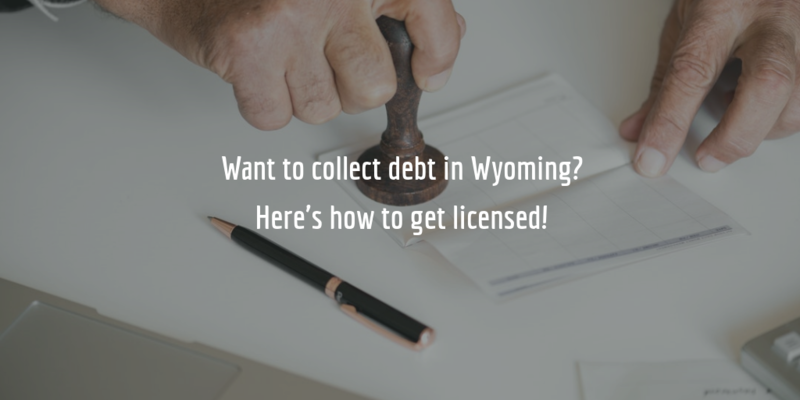 To conduct third-party debt collection in Wyoming, you will need to get a license. As of August 1, 2018, the Wyoming collection agency license is issued and renewed through the Nationwide Multistate Licensing System (NMLS). The application process includes completing a number of forms, submitting financial statements, as well as posting a collection agency surety bond. See below for an overview of the whole application and licensing process! If you fall within any of these categories, then you will be required to go through the licensing process. Note that if you collect only business debt in the state, then you do not need to get licensed! The licensing process is completed through the website of the NMLS. You can find a complete checklist of all the items you need at the NMLS page of Wyoming state. If you’ve never used the NMLS website previously, you will need to register. After that, you can begin your Wyoming collection agency license application by uploading a number of forms and documents to the website, as well as completing several on the website itself. Provide a letter of credit report explanations that explains derogatory credit accounts as well as proof of payments, arrangements, disputes filed, etc. Offline you will need to complete sections I and II of a bank reference form and forward the form to any financial institution where you currently hold accounts. You will also need to provide details about your resident manager on the checklist linked to above and mail it to the NMLS along with a copy of your Resident Manager Written Agreement. Once you’ve covered the whole list above and completed or uploaded all of the required forms, your application will be processed, and you will be notified through the NMLS regarding its approval and issuance. If you have any further questions, you can always contact the Wyoming Division of Banking. See the next section for a brief explanation of why you need a collection agency surety bond, and how much it might cost to get bonded! Applicants for a collection agency license in Wyoming require a surety bond as a form of guarantee that they will comply with the provision of the Wyoming Statutes. In particular, the bond guarantees that collection agencies will pay any debts they collect less the fee for collection as is specified in the agreement with the client. So, if a collection agency does not comply with such a contract and fail to turn over proceeds of collections, their clients may file a claim against their bond. Under this circumstance, the surety that backs the bond will compensate claimants up to the full amount of the bond. After that, the bonded collection agency will need to reimburse the surety in full. The cost of getting bonded is different from the bond amount. To get bonded, you will need to apply for a bond with a surety and will be offered a rate or premium you need to pay. This rate is determined on the basis of high or low your personal credit score is. For a credit score of over 700 FICO, you can expect to be offered a rate between .75% and 1.5% of the total bond amount. So, for example, if you have to obtain a $10,000 surety bond and are offered a 1.25% rate on your bond, you will need to pay only $125 to get bonded. You can request a free quote on your bond by completing our bond form. If you have any further questions about this bond, don’t hesitate to call our bond experts at 866.450.3412!